With our new Wireless Traveler unlimited internet access program in over 110 countries, we are often asked, what does a Gigabyte of data give me? Or how much is a typical email? You can now quickly reference this with our WT Media Chart. A regular email with no attachments ranges from 3 to 10 KB, and a low resolution photo that you post to Twitter or Facebook or even send back home to friends and family will use about 500 KB. Listening to music uses a bit more data, at 3 MB for a 3 minute song, while downloading movies takes you up to about 700 MB, which we would not advise you to do. Fair use policy actually inhibits the continual streaming of movies and videos. So next time you travel abroad, stay reliably connected. For those travelers who are not familiar with Pocket WiFi devices, the Wireless Traveler Hotspot allows you to connect up to 5 devices to the internet at one time (ie.Smart phones, iPad, Laptop, Kindle etc). anywhere you are such as on the train, in a taxi, at the beach, or just out and about strolling through Europe. Enjoy your own private, secure hotspot anytime you want to use it. Just give us a call a week or so before you travel and we would be pleased to organize a WT Pocket Wifi for $99.99 plus shipping for up to 1 week that works in 110 popular destinations. 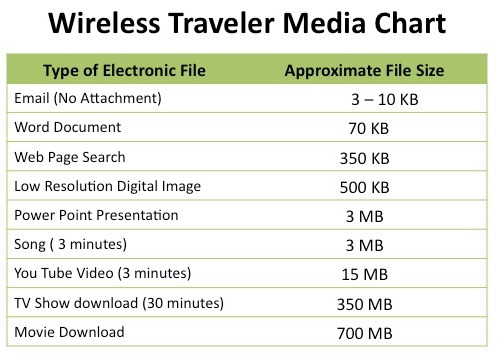 For longer and extended stays please contact a Wireless Traveler Customer Associate at 1-866-700-3883.